This website covers the results from a system of forecast tools that have been developed for relativistic electron flux at geosynchronous orbit (GEO). 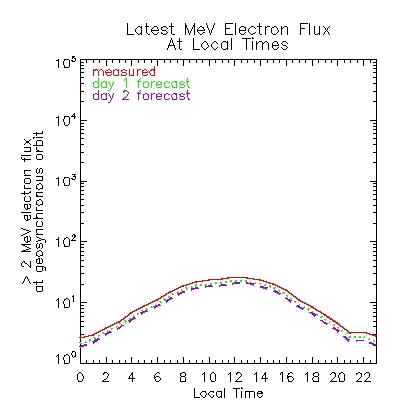 The main plot above shows the comparision of > 2 MeV electron flux measured by GOES-11 with forecast results. The forecast shown is a weighted average of three independent forecast models, which include solar wind measurements, a seed population, and an internal source. The individual models and their weights for this run are discussed here. 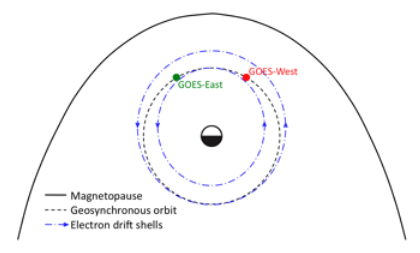 The shaded envelope shows the range of fluxes that can be expected as a spacecraft passes through different local hours around GEO (see schematic on the right). This range is estimated using flux mapping with statistical asynchronous regression (SAR). The smaller plot above shows the last measured, day 1 and day 2 forecast flux values mapped to each local hour using SAR. The SAR technique captures the local time dependency of the electron fluxes due to the asymmetry of the magnetosphere, using statistics compiled from GOES flux and solar wind velocities from 1995 - 2009. For more discussions and the Dst index prediction, see [Temerin and Li, 2002; 2006; Li et al., 2001b]. These and other papers are available here. Monthly plots of predicted MeV electron flux and solar wind data from 2000 to the present are available in this archive. 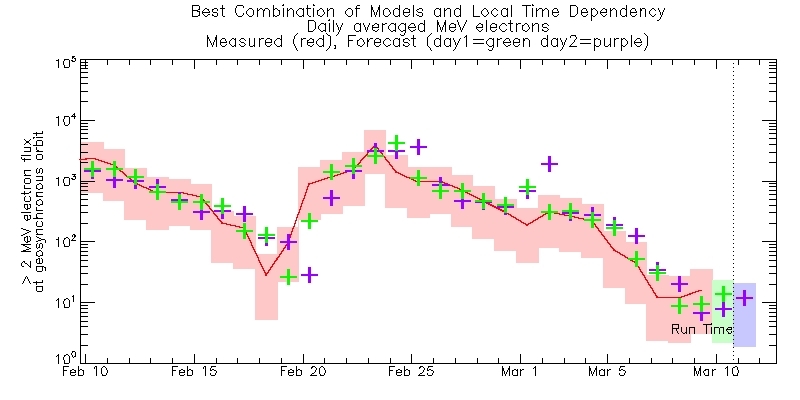 DSCOVR real-time solar wind plots are available for the last 30 days and the last 96 hours. For further information, contact Xinlin Li.